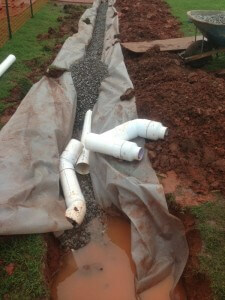 The unique conditions of the soil here in Lexington, Oklahoma can lead to yard drainage problems around your property. When the rain water is allowed to build up around the foundation of your home, it can lead to potential problems that will cost you a significant amount of money to repair. When it comes to yard drainage in Lexington, OK, Bill’s Custom Concrete has been installing well designed yard drainage systems that will quickly remove the water buildup in certain locations on your property and have it relocate to areas it can disperse evenly. The problem here in the Lexington, OK area is that with the clay soil conditions the water tends to linger on the surface. Your property may not have been graded correctly and the water is not able to access the curb or storm drains correctly. The experts here at Bill’s Custom Concrete can show you how different drainage systems work and which will be a better fit for your particular property. 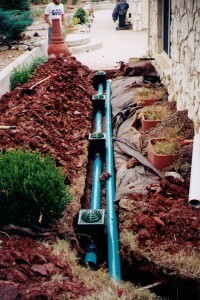 We can show you how a French drainage system can actually benefit your home and your landscaping at the same time. A trench will be dug near the area of the home where the water is accumulating, and then pipes will be installed that will carry the water away from that location. The pipes can be directed towards plants in your landscaping that need water. As the water builds up from a rainstorm it works its way to the pipe and then towards the landscaping. Usually the piping has small holes in it to allow the water to feed sections a little at a time. Our yard drainage solutions for your Lexington home or business can be as simple as adding the proper guttering to certain sections of your home to eliminate the water from accumulating in areas around your home where it can damage your foundation. 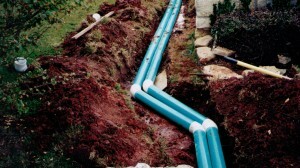 We may also offer a yard drainage solution that is multifaceted that involves several different solutions to your particular problem. We offer a free yard drainage and foundation inspection to determine how to fix your specific drainage problem.